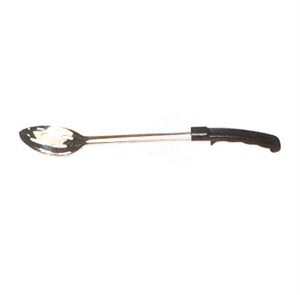 Winco BHSP-11 Slotted Basting Spoon with Stop Hook, 11"
Quality materials and a clever design make the Winco BHSP-11 Slotted Basting Spoon with Stop Hook, 11" a great choice for commercial kitchen use. The head of this sturdy stainless steel basting spoon is slotted, so you can use it to draw vegetables, potatoes, meatballs and more out of their marinade or cooking liquid. The spoon features a heat-free Bakelite handle and a stop hook, which prevents the spoon from sliding into the pot or pan.